Ah, chocolate! There’s nothing quite like it. Wherever you travel, you probably seldom pass a shop without at least a wistful glance or an audible “Yum!” at those delectable chocolate creations. Given the opportunity, you blissfully follow your nose to all things chocolate. That includes the enticing world of chocolate festivals, museums, factory tours, attractions, other chocolate-themed travel, and superb chocolate. Let’s take a taste of just a few. During the 2006 Winter Olympics, all eyes are on Turin, Italy. When you think of chocolate, Turin is not the first place you think of. But the city’s rich chocolate heritage dates back centuries. The ritual of drinking chocolate and the city’s vibrant café culture took root in the 1700s, and is still going strong today. The must-try drink is the bicerin, which means little glass. Served very hot in small glasses, this incarnation of smooth melted chocolate, a jolt of espresso and a topping of fresh cream was concocted at Café Al Bicerin, which still stands where it was built in 1763 location on the Piazza della Consolata. 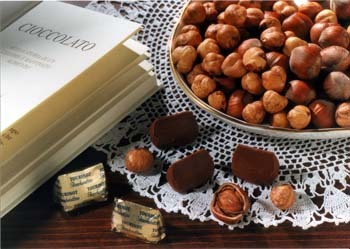 Turin is well known for its foil wrapped candy — gianduiotto — a tantalizing blend of chocolate and roasted hazelnut paste. There was a time when cocoa was hard to come by, but folks still wanted their chocolate fix. So in the mid-1800s, a few enterprising chocolate makers came up with the idea to extend the chocolate supply by adding the nut substance. They found the hazelnut to be a perfect solution since it grows abundantly in the Piedmont region in which Turin is located. While in Turin, look for exquisite handmade chocolates from Caffarel, Gobino and Peyrano. These artisans import the best cocoas to perpetuate the fine art of chocolate making. Turin’s annual chocolate festival takes place in early spring. This year’s event is slated for March 24-April 3. Also check out the ChocoPass, which you can buy at Turin’s Information stations. This is your go-card to indulge in 10 mouthwatering samples of Turin’s best chocolate confections in 24 hours, or opt for 15 in a 48-hour period. When you sail on Carnival Cruise Lines’ Conquest or Glory, don’t miss the incredible chocolate buffet. The challenge is to choose among more than 30 savory items that look as good as they taste. Take your pick — the orange-chocolate gateau, melt-in-your-mouth fudge, truffles, or a specially created decadence. Carnival’s Corporate Executive Chef Peter Leypold came up with one buffet favorite — what resembles chocolate sushi. For those who contemplate being health conscious, go for the fresh fruit, but, of course, you must dip this in chocolate syrup. 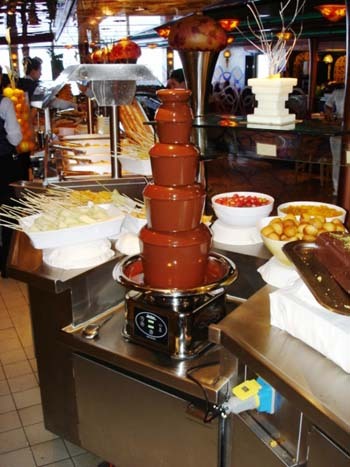 Take a gander at the chocolate fountain that overflows in rich chocolate, and then dip to your heart’s content. Except for the chocolate ice cream — aided and abetted by chocolate toppings — all desserts are made from scratch. Working almost around the clock, it takes at least 20 pastry chefs on each ship to turn out such a chocolate lover’s buffet delight. On a given day on both the Conquest and the Glory, nearly 3000 portions of chocolate desserts are consumed. Lovely Belgium is one of the most underrated international destinations. This small, accessible country is easy to get around in — from the vibrant cities of Brussels and Antwerp to the countryside. Belgium chocolates are known for their scrumptious, creamy centers. While in Brussels, be sure and visit the Chocolate Museum. Between the guide and video, you’ll come away with a wonderful picture of cocoa and chocolate production. 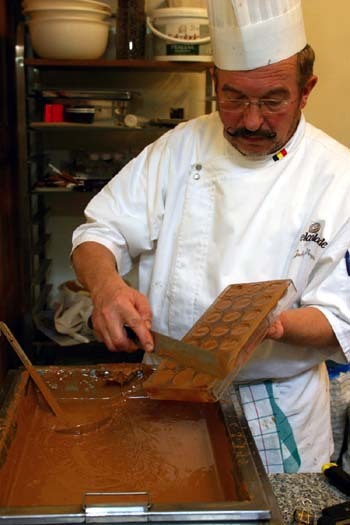 Nearly everyday, a chocolate master is on hand to demonstrate chocolate-making. And you’ll have the chance to taste the quality of Belgium chocolates. Only an hour by car or train from Brussels, the charming medieval town of Brugge (Bruges) was added as a UNESCO World Heritage Site in 2000. Brugge is a treasure trove of narrow, cobblestone streets, footbridges, magnificent Gothic arches and expansive squares. It’s only fitting that a chocolate museum should open in one of the historic buildings. 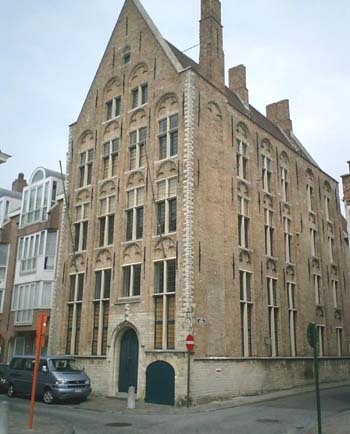 Choco-Story, The Chocolate Museum opened nearly two years ago in the Maison de Croon, which dates to around 1480. At Choco-Story, you’ll learn about the transformation from cocoa to chocolate, see exhibits of chocolate pots, view chocolate-making demonstrations, and more. Children between 6 and 12 get to play The Chociala Game as they progress through the museum. Also on tap for this year is the Choco-Late, Brugge’s chocolate festival from April 28 to May 1. The spectacular Rhine River serves as a backdrop for the sleek, contemporary and exceptional chocolate museum — The Imhoff-Stollwerck in Cologne, Germany. Exhibits are superbly presented in this three-story glass structure. One of the showstoppers is a gigantic gold fountain that overflows in warm chocolate, and yes, you can taste. Just take a crispy wafer and scoop up the creamy chocolate. A walking city, Cologne makes it easy for travelers to meander along the riverfront, linger at a café and visit the magnificent cathedral. To experience the best of both worlds, visit The Spa at The Hotel Hershey in Hershey, PA. If you’ve ever dreamed of immersing yourself in chocolate, opt for luxurious pampering with a cocoa bean polish or a 25-minute foaming chocolate milk bath. Note the jars of Hershey Kisses in all the spa rooms. And, then, of course, you must visit the ultimate chocolaty town with its theme park and factory tour. In Hershey, every meal ends in chocolate. Just across the Maine border, picturesque St. Stephen, New Brunswick, with its tree-lined streets and countless green parks has rightfully earned its moniker as “Canada’s Chocolate Town.” Chocolate permeates the air with its 133-year-old Ganong chocolate factory and adjacent museum. The fun-for-all-ages chocolate festival has been around more than 20 years and generally runs about 10 days beginning the end of July. Stick around for Choctail Hour. When you think about Las Vegas, chocolate is generally not the first thing that comes to mind. But, just 15 minutes from the famed “Strip,” Ethel M Chocolate Factory in Henderson, NV, creates more than 50 different kinds of chocolate — from truffles and crèmes to nuts and caramels. After your self-guided tour and behind-the-scenes glimpse at the candy-making process, amble to the adjacent Botanical Gardens that boasts 350 species of desert plants. Step back into the 18th century in Washington, Kentuckey, and enjoy the town’s annual chocolate festival, which is set for April 8-9 this year. Stroll the historic village, stop at dozens of booths, participate in chocolate eating contests, or gather at the “Annual Chocoholics Reunion.” The kids can go on a chocolate candy hunt. Now part of Maysville, Washington is nestled four miles south of the banks of the Ohio River, 51 miles east of Cincinnati and 50 miles northeast of Lexington, KY. The town boasts some 119 original log cabins, and its historic district has 45 buildings, most of which were built between 1785 and 1812. This chocolate tour could include many more destinations — f rom Cadbury World in Bournville, England or the annual Ghirardelli Square Chocolate Festival in San Francisco to the Museum of Chocolate in Caslano-Lugano, Switzerland or the Boston Trolley Chocolate Tour. The list goes on, and so does our love for chocolate.